Portland, OR (May 15th, 2011) -- Subaru Rally Team USA's David Higgins and co-driver Craig Drew took a commanding win at the Oregon Trail Rally, round four of the 2011 Rally America Championship. Higgins finished 3 minutes 26.9 seconds ahead of rival Antoine L'Estage and won ten of the fifteen stages. It was a tight battle with David Higgins but the Mitsubishi Rockstar crew of Antione L'Estage and co-driver Nathalie Richard suffered three tire punctures in a row on day two, which cost them the chance to keep pace with Higgins. Oregon marks Higgins' second consecutive victory of the season having just won the Olympus Rally two weeks ago in Washington State. Higgins now assumes the overall Championship from Travis Hanson, who has lead the points race since the opening round at Sno*Drift Rally. The Oregon Trail Rally began Friday with spectator stages held at the Portland International Raceway before moving to the scenic farmlands in and around The Dalles and Dufur for days two and three. Oregon Trail began as a dry and dusty rally, but was consumed by heavy rains and thunderstorms during the middle of day two. The inclement weather forced event organizers to cancel the last two stages of day two and shorten some of day three's stages. In addition to the changing weather and road conditions, attrition quickly set in for several teams including Subaru Canada's Pat Richard and co-driver Leanne Junnila. 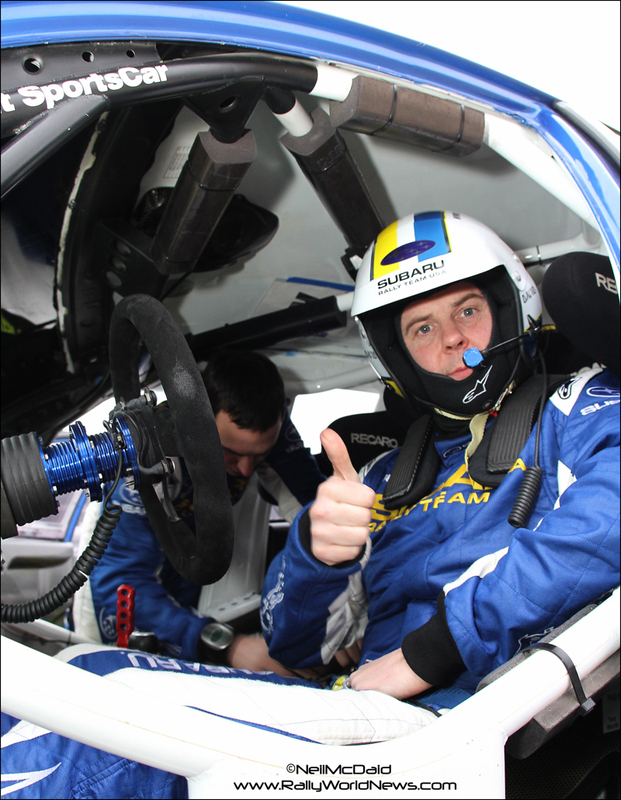 Richard was forced to retire on Stage 8 due to persisting fuel pump problems. Another notable retirement was Subaru Rally Team USA's Dave Mirra and co-driver Marshall Clarke, who were in third overall before Saturday's stages before crashing out on Stage 6. Super Production (SP) driver Ramana Lagemann and co-driver Chrissie Beavis completed the overall National podium by finishing a distant third despite having engine issues on day one. Lagemann also took the SP class win over Travis and Terry Hanson by a mere 3.6 seconds, but the results remain provisional pending a protest about Lagemann filed by Hanson. The Hansons put in a solid run and lead Super Production up until the morning of day three when they began battling closely with Lagemann for the class win. Travis Hanson is still in contention for the overall Championship and is now closer to securing the 2011 Super Production title. Local driver Paul Eklund and co-driver Jeff Price took third in SP and ninth overall. In Two-Wheel-Drive, Scion xD driver Andrew 'ACP' Comrie-Picard and co-driver Jeremy Wimpey took the class win and placed seventh overall. ACP, who won the 2010 Oregon Trail Rally in Open class, finished 26 seconds ahead of Mazda Speed 3 driver Wyatt Knox. Knox and co-driver Ole Holter spent the entire weekend entrenched in a close battle with the Scion team, but finished second in class and eighth overall. Ford Racing Fiesta driver Dillon Van Way and co-driver Jake Blattner finished third in class and 12th overall, but fell minutes behind ACP and Knox early in the rally after having suspension issues. Brian Gottlieb and co-driver Pat Darrow finished behind Van Way, taking fourth in class and 13th overall. The Oregon Trail Rally ran one Northwest Regional event on each day of the event. Carl Decker and Adam Craig won the 'Wagons Ho!' Regional hosted at Portland International Raceway with 27.4 seconds over Brian Svedin and co-driver Teresa Buren. Mark Tabor and co-driver Ben Bradley placed third. Brian Svedin and Teresa Buren won the 'Shunpikur Stages' Regional held on day two, finishing 16.6 ahead of Decker and Craig. Byron Garth and co-driver Greg Allen placed third. Decker and Craig came back on day three to win the 'Trails End' Regional by 36.5 seconds over Svedin and Buren. Dave and Richard Hintz finished in third place. The next round of the Rally America National Championship is the Susquehannock Trail Performance Rally in Wellsboro, PA, this June 3-4.